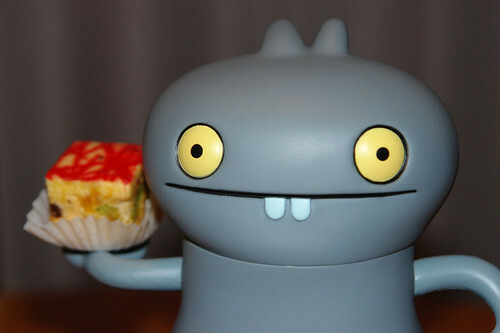 Uglyworld #279 - Babo Scores Some Cake (8/365), originally uploaded by www.bazpics.com. Tonight as I made my way back to the hotel after dinner I noticed that Babo was transfixed by something in the window of a nearby bakery. I went back to see what was drawing his attention so much, he told me "look baz, that cake looks awesome, can I have some monies to buy a piece?". I handed him enough cash for a single piece which he then bought and carried carefully back with him to the hotel.